Locke Design & Woodworks can construct virtually anything of wood and this is reflected in the studio space. The well-equipped shop features a full complement of hand tools, power tools and a computer controlled (CNC) router. On any given day Wayne Locke might be found using chisels and hand planes at his bench, technologies hundreds of years old, while the CNC router, the latest technology, carves or cuts at the far end of the studio. This blending of the latest technology with an older and more human sensibility is central to the craftsmanship and aesthetic vision of Locke Design & Woodworks much as that same tension inspired the arts and crafts movement. 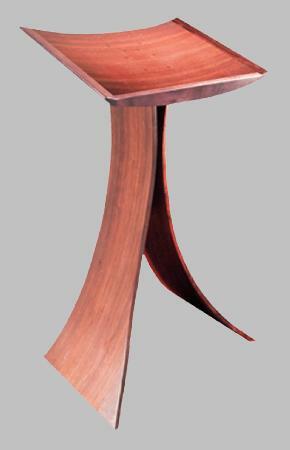 The portfolio pages illustrate the range of work from Locke Design & Woodworks. These designs go from the spiritual to the officious to the whimsical all the while maintaining a contemporary sensibility with fine craftsmanship. Wayne Locke grew up building things and with a curiosity for how things work. After receiving a BA in English at the University of Texas at Arlington, he worked for four years in a custom furniture shop in Houston, he started Kodama Woodworks (kodama, a Japanese word meaning the spirit of a tree) in January 1980. Kodama Woodworks was a studio dedicated to residential and office furniture but after building the chancel furnishings for Christ the Redeemer Catholic Church in 1982 his focus began to change in two ways. First, the design and construction of church furnishings became a prime interest and, second, veneering became a significant aspect of his work. The design and construction of chancel furnishings now accounts for about 75% of the work done by Locke Design & Woodworks every year. Wayne Locke moved his studio to Austin in 1989 and about 10 years later built and moved into his current studio just outside of Austin on two acres where he also lives with his wife and son. The studio space is about 1700 square feet with additional work and storage space below. In 2006 the studio was renamed Locke Design & Woodworks, a dba of Lockeworks, Inc. Throughout all of the changes, the commitment to fine design and superior craftsmanship has remained constant.